I love being a blog ambassador for Aerosoles. With a new style to try out each month, who wouldn't? For June, I picked out the low stacked wedge gladiator sandal, Yet Another, in tan (the trendy style also comes in black and olive green). The shoe stands out because of the three contrasting buckles on the leather upper. To be honest, when I first tried the shoes on, I wasn't sure how comfortable they would be mainly because of the location of the buckles. But when I actually wore them to work, they were surprisingly easy to navigate the hard city streets in. And each time I wear "Yet Another," the better they feel. The shoe's comfort factor is due to the Heel Rest Design that distributes weight towards your heel and away from the ball of the foot, and the Diamond Flex Sole absorbs impact and disperses friction and weight. 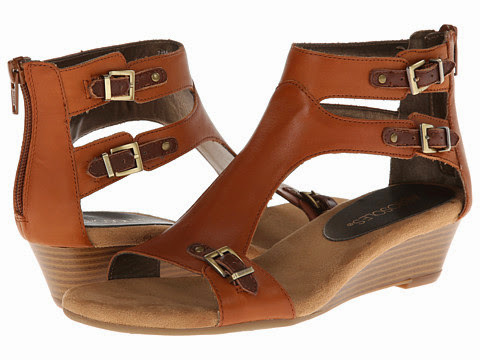 Yet Another is way too modest a moniker for these signature sandals. But once you get one pair, you may want to pick up...yet another.